Mythware Language Lab Management Software | Planet TechEd Inc.
Net movie, Tests, and more. interactivity and collaborative wor and providing tools to organize lessons and assess student progress. Answer sheet editor, quiz editor, oral test editor, and repeater courseware editor, all these useful tools can be found in the Tool Box. Instructor can manage the teaching resources and set whether to allow students to browse or choose a certain courseware. Also the instructor can facilitate centralized management of teaching resources and independent learning. Instructor can execute some command to student remotely, such as power on, shut down or restart students’ computer remotely, close applications, log in Windows and exit student side. Instructor can also set plentiful things of student side remotely, e.g. display settings, proxy server,themes, desktop and so on. Mythware language lab software is designed to help instructor to deliver the language learning class more interactively and actively. Besides the various functions such as screen broadcast, voice broadcast, net movie, this software helps student focused on and involved in learning. Allow a selected student to present his work to the instructor and the selected students. Share the movie in the instructor’s computer to the selected students in the class in real time. The instructor can open the camera to watch the image of student during speaking, intercom, simultaneous interpretation or voice monitor. To open a certain amount of students’ cameras at the same time is also available for instructor to accomplish. 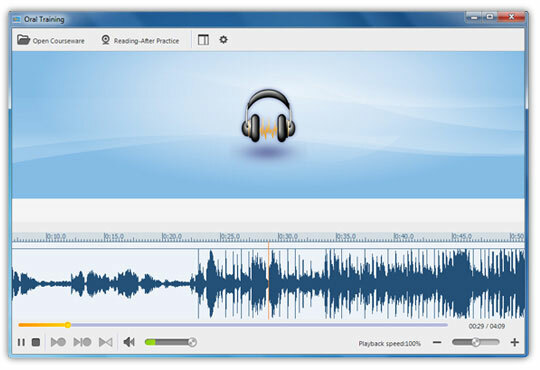 Other live or prepared material also can be broadcast when instructor’s computer is connected with external devices, such as tape-recorder, notebook or recorder. Test your students in a short period of time with quick answer sheet or customized answer sheet. By using broadcast teaching, the instructor can broadcast his voice and computer screen to the students in seconds. With the video capture card, the instructor’s computer can be connected with other external device. So voices and images from other sources can be live broadcast. 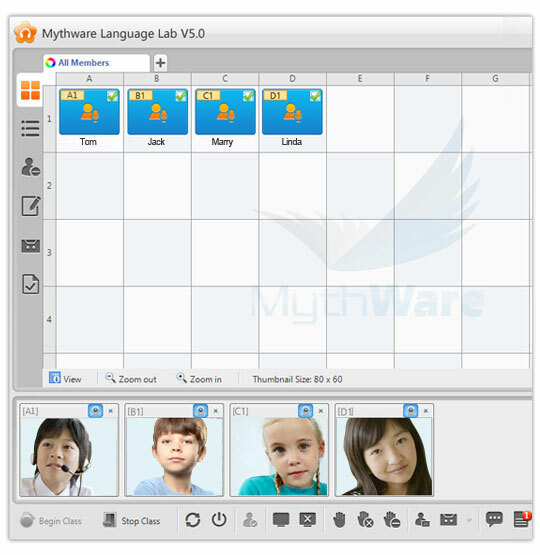 Besides the interaction between students and instructor, group activities of Mythware language lab software also enable the interactive communication and discussion between students. Instructor can divide the students into different groups and let them share their screens and files with each other. Instructors can create groups and identify one active member in each group as group leader and this group leader can conduct some of the functions, such as Screen Broadcast, Monitor and so on. According to the actual situation, the instructor can divide the students into several groups and conduct different teaching activities to different groups. 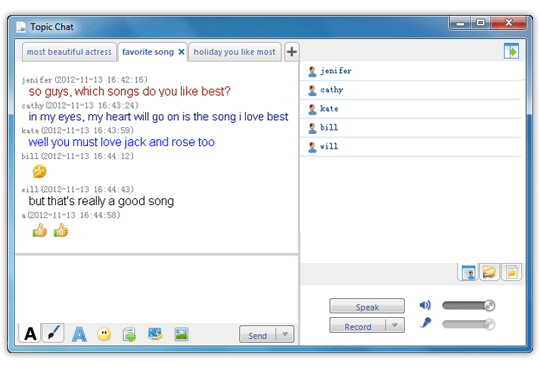 Instructor and students can exchange their opinions and messages by group chat. 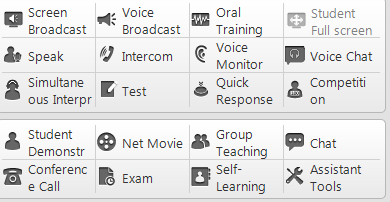 Instructor can set different chatting topics and students can choose to join which topic by one click. Also instructor can choose one of the topic groups to join the chat. Practice makes perfect. For language learning, you need plentiful oral practice. With language laboratory software, instructor can conduct Oral training, speak, intercom to students. When students participate in those activities, they need to talk, talk and talk. To improve student’s oracy, instructor can choose one or more students to do participate in the training. Also during the training, the instructor can talk with one or more students, monitor one or more students voice. To select one or more students to answer a question or do the translate mission during the class, instructor can let the student speak just by one click. To keep other students do not affected by the speaker, such as during an exam, the instructor can use the intercom function and he will be the only one who can hear what the speaker says. Launch a conference call and let one student communicate with another student orally. Language lab software for schools makes the class management much easier. Instructor can monitor the student screen and voice in real time, decide what kind of websites and applications that students have access to, offer help to the students who may have some troubles during the class. Let the students only have access to the website on the white list or define the detailed websites on the black list which they have no access to. With application policy view, instructor can check the applications that students open now. And he can set the white list and black list for students so that he controls the exact applications that students can operate or not. Instructor can control the USB disk of every student in his class. 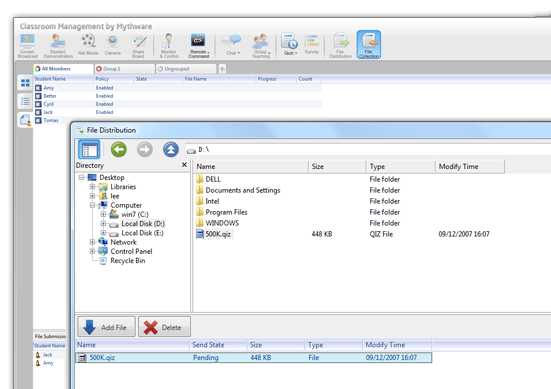 With USB Disk policy view, instructor can see the detailed setting for each student clearly. By checking the History Message/Event Dialog, instructor can see the message sent by the students, event information of student log-in and log off, student connection information, file submission and so on. For some shy students who are not active enough to express themselves, they can get the help from the instructor just by sending one message. Guide every user for installation of Language Lab.